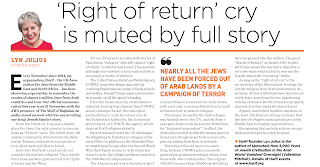 In the run-up to 30 November, the Day to commemorate the exodus of Jewish refugees from Arab Countries, Lyn Julius of Harif reminds readers at Jewish News that Jewish refugees are still an unresolved injustice in spite of their absorption into Israel and West. She reveals that US money for Palestinian refugee resettlement was diverted in the 1950s. 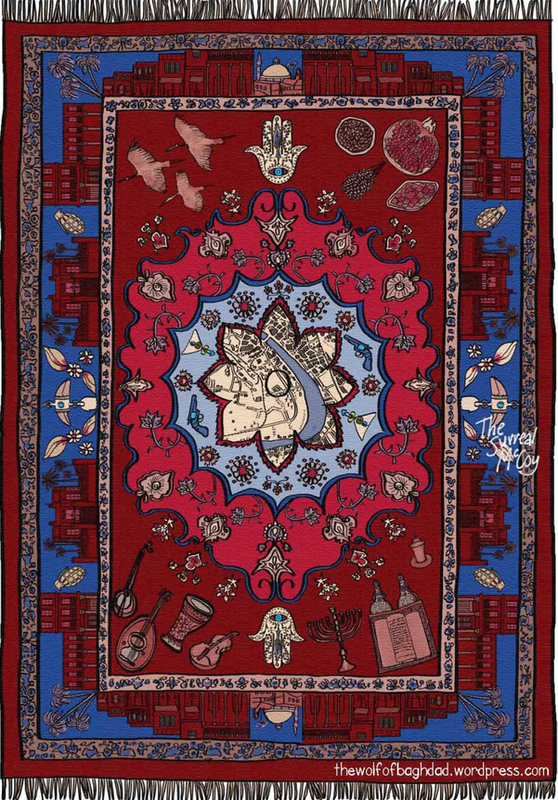 The Iraqi-Jewish 'war rug' from Carol Isaacs' (aka The Surreal McCoy) Wolf of Baghdad. 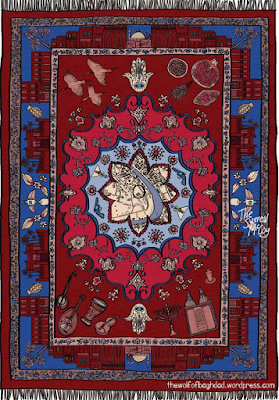 War rugs had woven into them objects and memories from the life of the community. Every November since 2014, my organisation Harif – the UK Association for Jews from the Middle East and North Africa - has been observing a Day to remember the exodus of almost a million Jews from Arab countries and Iran. Our official commemoration was on 21 November : the JW3 premiere of The Wolf of Baghdad, an audio-visual memoir with live music, telling one Iraqi-Jewish family’s story. From the 1940s on, Iraq was a deadly place to be a Jew. It was the only country to execute Jews as ‘Zionist’ spies. The 2,600-year-old Jewish community, which wrote the Babylonian Talmud, endured vicious persecution. Most were airlifted to Israel. No Jews who fled Arab countries still consider themselves refugees. They rebuilt their lives and were granted full civil rights in Israel and the West. Yet our TV screens are alive with stories of Palestinian ‘refugees’ ( who still claim a ‘right of return’ to what is now Israel. This demand, although non-existent in international law, is not simply a matter of rhetoric. The United Nations Relief and Works Agency, UNRWA, keeps the refugee issue alive by confining Palestinians to camps. It funds schools and welfare. Donald Trump raised a storm when he recently cut off UNWRA funding. Even the Israel security establishment objected, fearing that dismantling UNWRA would endanger Israel. But education and healthcare could be turned over to the Palestinian Authority, the Jordanian government, or UNHCR, the agency which deals with all refugees globally. Recent research notes that the United States actually discharged its obligations to Palestinian refugees in the early 1950s. In addition to the Marshall Plan to rehabilitate Europe after World War II, the US gave money to Arab states and Israel to solve the refugee problem created by the 1948 War of Independence. The American aid was to have been split evenly between Israel and the Arab states, with each side receiving $50 million to build infrastructure to absorb refugees. The money to resettle the Arab refugees was handed over to the UN, and the Americans gave Arab countries another $53 million for “technical cooperation.” In effect, the Arab side received double the money given to Israel even though Israel took in more refugees, including Jews from Arab lands. But none of this aid went into resettling Arab refugees. Instead UNRWA gives successive generations permanent refugee status, even those with other nationalities. The original 700, 000 (no more than 30,000 are still alive) have burgeoned into 5 million. The great “March of Return” on Israel’s 1967 border with Gaza demonstrates that the marchers’ objective is not a two-state solution, but to overrun the Jewish state with “returning” Arabs. As long as the “right of return” is the cornerstone of the Palestinians’ strategy, the Jewish refugees from Arab lands remain its antidote. All but 4,500 Jews have been forced out by state-sanctioned terror, abandoning billions of dollars’ worth of land and property —equivalent to four times the size of Israel itself. A grave, unresolved injustice was done to the Jews. But they are a living reminder that two sets of refugees exchanged places in the Middle East in roughly equal numbers. Recognising this fact can help achieve an equitable solution and be a step to peace.